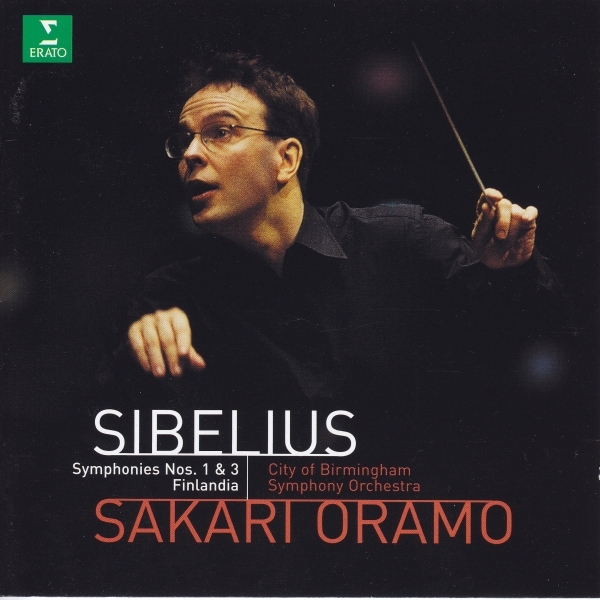 This is the third disc in Oramo’s Sibelius Cycle with the CBSO. The others have been well received, but not raved over, and this issue is much the same. If one compares the current disc with it predecessor (CBSO under Simon Rattle, recorded in 1987) we have a big improvement on the earlier performance, which to these ears sounds quite perfunctory at times. In Oramo’s hands, there is a much firmer grip, and a much more attractive sense of growth in the phrasing, particularly in the Third Symphony. This is heard very clearly again in the First Symphony, where Oramo is not only faster against the clock in all four movements, but the performance sounds faster than the actual timings would imply. In addition, Erato have the very big advantage of recording in Symphony Hall, whereas the Rattle was recorded in the Butterworth Hall, Warwick, and the superior acoustic plus the general improvements in technology in the intervening years have all added to the difference between the two performances. There is one very serious drawback to the performance of the Third, and that is the pace of the second movement. If you feel that this movement should be kept on the move, then you will be bitterly disappointed. For example, if we compare the timings for this movement, we find that Sakari Oramo takes 11’21" against Simon Rattle’s 9’43". If we then go back a bit further we find that Lorin Maazel takes only 8’11", and Anthony Collins a mere 7’.25". I know that some critics feel that Collins is a little fast, but an extra 4 minutes in 7 is a bit extreme. I do not have any major problem if a conductor wants to follow modern practice and slow down wherever possible to enhance "feeling" and "relaxation" but this is merely soporific, and the playing does not help to dispel this atmosphere. Colin Davis, on Philips, turns in this movement at a slow 10’ 17", but makes the experience far more enjoyable. The Second Symphony is much less controversial, and I enjoyed this performance very much. Timpani are fairly prominent in the first and third movements, but do not leap out at you as they do in Collins’s performance on Beulah, (an ex-Decca recording). 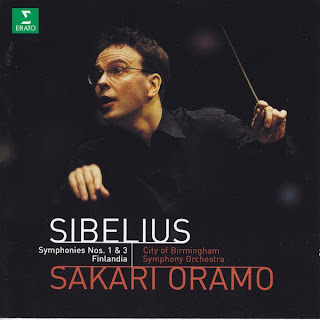 Still, no other performance, in my experience captures the sheer thrill of early Sibelius as this performance does, so I suppose I should not be so critical. Oramo’s recording is far more naturally balanced, and so there is a possibility that the earlier Decca recording was partly responsible for this, in addition to an amount of nostalgia crowding in. A somewhat similar situation exists with the scherzo of the first with the timings as follows; Sakari Oramo 5’11", Simon Rattle 5’41", Lorin Maazel 4’53", and Anthony Collins 4’28". Such variation has you wondering just what is going on. In general, the older the performance, the faster it is played. I will leave you to decide. The disc is completed with a performance of Finlandia, which whilst perfectly decently played, and making its usual impact at the conclusion, for me does not materially affect the decision of whether to buy or not. Most collectors will probably have a performance of Finlandia anyway, and it would have been nice to see a less well known Sibelius filler in its place. For a modern performance of these works, the current disc is excellent, whilst not being absolutely unmissable. Thanks for those kind words of encouragement. @Robert, glad I've provided some fun for your research into Singapore's trees. Hey YM! Thanks a lot for your kind contribution! I guess this is going to me my first symphonic Sibelius! Is is written in Portuguese and in English. hi, may i ask why you stopped posting? Maybe because all the Megaupload links are dead due to the US Federal Government shutting them down?